In a region already dealing with the potentially devastating effects of the offshore oil drilling disaster, the southern United States has been dealt more blows by recent severe weather. Storms over the weekend brought rain, thunderstorms, tornadoes, and severe flooding to much of the South, killing more than 30 people. 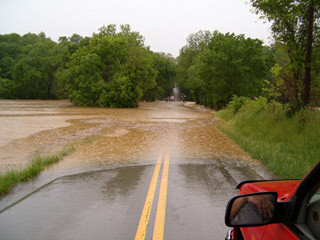 The storms closed down major highways and forced many to evacuate their flooded homes. Tennessee and Kentucky were particularly hard hit over the weekend, with parts of Tennessee receiving well more than a foot of rain (this site documents some of the numbers; NWS rainfall maps can be found here and here); Nashville, TN, (13.53 inches) and Bowling Green, KY, (9.67 inches) were among the cities that set records for two-day rainfall (record-keeping goes back to the late 1800s). Last week, a series of more than 50 tornadoes struck nine southern states, killing at least 12 people and causing severe damage to dozens of homes. The most powerful twister tore through Yazoo and Holmes counties in Mississippi and was classified by the NWS as an EF4, with maximum winds of 170 miles per hour. That tornado was also record-setting: It was the widest tornado to ever pass through Mississippi, measuring 1.75 miles at its widest point, as well as the fourth-longest to ever hit the state, traveling 149.25 miles on a continuous path. The Jackson, Mississippi NWS forecast office details this tornado and a number of others in an online report on the tornado outbreak. The more recent of the two storm systems, the one that deluged Tennessee and Kentucky with flooding rain, had at least a tiny silver lining. While it at first whipped southerly winds across the oil spill in the Gulf, pushing the slick quickly toward the Louisiana coast, those winds shifted behind the storm’s cold front, blowing offshore and curtailing the advance of the oil toward Mississippi, Alabama, and Florida. A blog post by AMS member Jeff Masters, who is also director of meteorology for the Weather Underground Web site, details the massive flooding and discusses the future movement of the Gulf Coast oil slick.